The day began with a bit of trepidation - would the people at Awesome Adventures (with whom we had a 5-day booking for one island trip) have made the necessary amendments to our itinerary (a three island, 6-day trip) and would we get the pick-up OK? Thankfully, things were not running at Fiji time - they were there on the dot in the big yellow bus that would transfer us to Denarau port (passing through what must be one of the most spectacular golf courses in the world, incidentally - go check Google for "Denarau Golf Course"). The port is a busy place to be at 9am. Every day, the Yasawa Flyer would leave port and take people to all of the islands, going up as far as Nanuya Lailai before turning around and heading back to towards Denarau, a round-trip that would take 9 hours. It was possible to hop from island to island using the service (assuming you had paid for the 'Bula Pass') and it made the Yasawa Islands very accessible. In previous years, it was impossible to island hop - instead, people would have to return to Denarau each time to get a different boat back out. 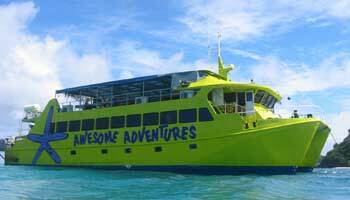 None of these boats could have been as comfortable, fast or efficient as the Yasawa Flyer - a good sized catamaran that, like our earlier bus transfer, was a completely unmissable shade of yellow/green. The boat was as much for the locals as it was for the tourists. White skin was in the minority here, and many of the locals were carrying boxes of produce of one kind or another back from the mainland to whatever islands they lived on or worked on. Manda spoke for much of the way with a nice lady called Nidia who had been born on the islands and had never left them (except for the aforementioned grocery shopping on the mainland). When I was handed the vouchers I noticed that they had indeed changed the itinerary, but there had been further changes to the printed vouchers that needed some more explanation. Our first two days were supposed to be on Nanuya Lailai, but our tickets had been amended by hand to read 'Wanna Taki'. What was all this about? Apparently, the resort on the island was full, so they had upgraded us to the Wanna Taki cruise. This was 'a good thing'. We had seen leaflets about this - air conditioned dorms and double rooms on the MV Taralala, sister ship to the Yasawa Flyer (another catamaran) and a chance to take in the island views from the water. Definitely a lucky upgrade (although it would mean Manda taking a few more travel sickness pills!). MV Taralala, home of the Wanna Taki cruise. 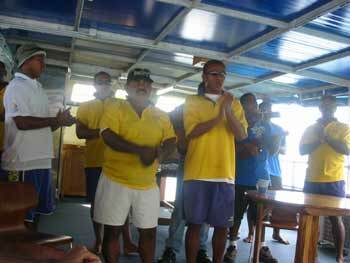 As we arrived at the boat - via a small transfer powerboat - we were met with a hearty welcome from the crew (guitars and all) ending with a booming 'Bula!' (bula being the Fijian greeting). We settled in very quickly and didn't have to wait too long before the first meal, a buffet with enough choice for most people on board, which actually wasn't that many. I had imagined it to be much busier but there were only about 11 people on the boat which could sleep 30. The crew almost outnumbered us but had been quieter - a glance at the visitor's book revelealed that on one day an English girl had been the only guest on board! 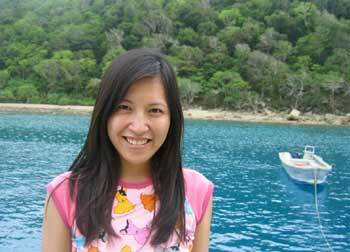 Manda in front of Naviti Island. We got on the boat at around midday but by 3pm we were already saying goodbye to some others on the boat. Thankfully, they were the noisy lot that would not be missed one bit including possibly the worlds most 'self-assured' Israeli guy - ie he loved himself and expected everyone else to. The funny thing was watching him try to smooth-talk an English girl with his set lines, to which she responded: "You know, I saw you do the exact same routine to a girl in Nadi Bay, you're not fooling me!" So, six went off, and when we joined it had only been Manda, me and another lady called Sylvie, a French-Canadian who was living in Japan. The transfer boat then returned with two more people to join our happy little throng, and they also happened to be French-Canadian. Sylvie was in her element. Guests staying on the Wanna Taki cruise had a few activities they could try out, such as snorkelling, kayaking or if the surrounding beauty got too much, the crew had a good selection of DVDs to choose from that you could watch from the comfort of the air-conditioned dorm/lounge downstairs. For my part, it was snorkelling all the way. Manda and I both went out as soon as we could to cool down from the afternoon sun and look at the numerous coral reefs that were just a short swim away. The water was very clear and we spent around 45 minutes gawping at all the fish that called this place home. 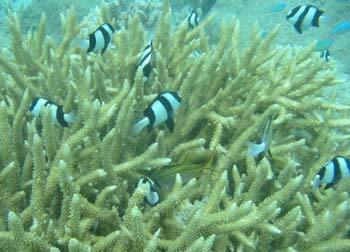 Coral and fish off Naviti Island. Later that day, the couple from Montreal went out for a bit of snorkelling. The light was fading a little, a bit overcast but otherwise nothing to worry about. Minutes later someone on deck pointed out something happening off the port side of the boat. I went over to take a look and saw this mist - or was it a fire? - heading our way. Just like that the boat went from being sat in calm waters and clear skies to sitting in choppy waters and torrential downpours. We all struggled to pull down the awnings as the rain battered in sideways. I have never seen rain come in so quickly and am not sure that I ever will again. It was also something of a shock for the snorkellers. While we were trying to take cover from the rain, Sylvie realised that they were having difficulty in the water and fetched a couple of life jackets for them. By the time she got to the landing platform they had already made their way to the boat (they said later that it had been a hair-raising experience). We stayed up for a little while in the evening chatting about all sorts, Sylvie telling us all about life in Japan; Karen and Kehlan/Kehlis (we never could quite agree on his name!) gave us the lowdown on Quebec and the differences between French and French-Canadian.